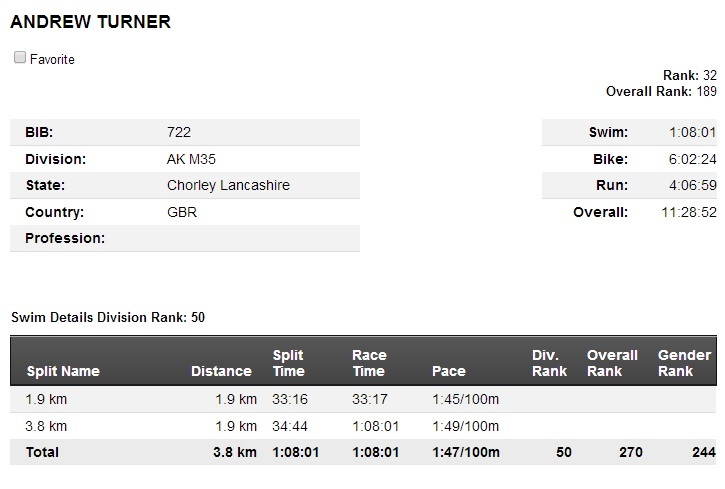 Merlin Cycles customer Andy Turner successfully competed in the recent Ironman UK in Bolton. I’m a Chorley lad who’s 37 years old (yes you can be known as a lad at that age). I have always been into sport of one kind or another. I started doing triathlon around five years ago after going to watch a workmate at his local tri event. Inspired by this I started my own little journey of good and bad races, all of which make you stronger for different reasons. This July I was one of the 2,000 or so athletes/crazy who took to the start line at Pennington Flash for Ironman UK. Swim: 3.8 km – two laps anti-clockwise with a mass start in the water. Athletes exit from the water after first lap to commence the second lap. Water temperature of 16-19C. Bike: 180km – the course begins with a 14 mile point to point cycle from Pennington Flash to join a new two lap circuit at Adlington. Travelling anti-clockwise on the loops and taking in 1270m (4166ft) of climbing. Run: 42km – the course elevation is 290m (950ft). After many months of training I found myself being awaken at 3am by the alarm clock. It was time to get up. I was sure I’d only just gone to sleep! The race was due to start at 6:00am so I needed to be up, fed, watered and out of the house by 3:30am. The forecast for the day was good but at 3:30am it was quite misty which all added to the atmosphere when we arrived at the Flash. I located my bike – which had been racked there the day before – and proceeded to place my bottles and food on it. I grabbed my track pump and checked my tyres for pressure. I gave a final spin of the wheels to check no brake rub. I didn’t really want any unnecessary resistance for 180km! With the bike all set, all I needed was a final toilet break before putting my wetsuit on. I headed off to the portaloos to find the usual good size queue found at all events. I was soon in another queue heading for the water with 2,000 other clones wearing wetsuits and white swim caps. I stood there looking at the faces of the people close by. Most looked nervous and a little unsure of what the “washing machine” swim start had in store for them. I politely pushed my way further forward until the faces had a more confident appearance. I’m only an average swimmer but I wanted to give myself a good starting position so I didn’t get held up. I was bobbing up and down awaiting tri legend Craig Alexander to start the race. I didn’t actually hear the hooter but suddenly everyone was off – and I was too. After two laps I had done the swim. I was feeling very comfortable and didn’t have any traumas to report. Running over the timing mat I clocked 1hr 8min which I was happy with. After a quick change it was then off on the bike leg. I had a race plan and so far so good. It was a long day and pace was key. There was no point doing two disciplines fast then having nothing left for the third. The bike is my strongest discipline but I wanted to use this to benefit the run. 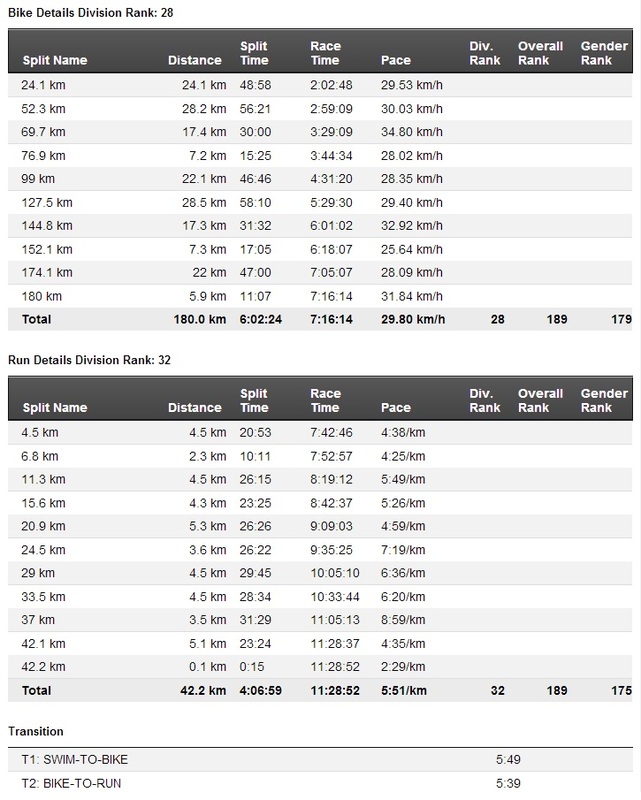 The plan was to maintain 30km/h for the 180km which would give me a 6hr split and still have legs to run. The bike route on paper didn’t appear to have much climbing but with more twist and turns it broke up the rhythm giving less time to settle on the sticks. It was a good route and I kept within my comfort zone and maintained an average of 30km/h getting into the Macron (Reebok) Stadium feeling good for the run. I located my running bag, changed into my trainers and off I went for the final 42km on foot to finish in Bolton. The weather had been dull so far but as I got into the run I could feel the sun starting to burn through the cloud. I looked up from under my cap and had a quick plea to Mother Nature just to hold the heat off. Luckily it never became too hot and with plenty of cups of water over my head, the great support from the mass of spectators on the course I found myself on the last 5km to the finish. Running back into town in the knowledge of only 5km to go I found extra speed in my running. I was soon turning off for the finishing shoot (which they cruelly make you pass three times on previous laps). Running down the carpet with the finishing line in sight was a fantastic feeling. And with the words “You are an Ironman!” I crossed the line. 11hrs 28mins after the start. I’m no sports star but on Sunday I got a taste of what that must be like. The number of spectators at Pennington Flash… all the people on the bike route… the entire run route in Bolton… finishing in the Square. Everyone made it a day to remember for all the competitors. Many thanks to Merlin Cycles for being on hand to help. Tagged iron man, merlin athletes, racing, team merlin, triathlon. Bookmark the permalink. I’m doing IMUK this year. wod you recommend a TT bike? I’m torn between the 2.